PLF 003HM by Louis Ferre is a Platinum Lace Front Hand Made wig. It's a short, sweet and popular style that flatters the face. 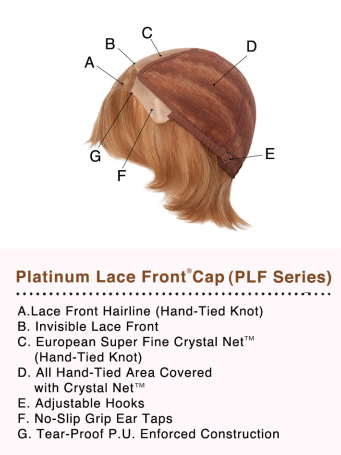 The combination of human hair with a lace front, monofilament and 100% hand-tied cap make this style top of the line. These high quality features give it a natural looking front hairline, a natural looking part on top, styling versatility, natural movement and supreme comfort. If you're looking for an incredibly natural, versatile and comfortable wig, this style has it all! Lace Front is hand-tied, ready-to-wear and creates the illusion of a natural looking front hairline that gives you amazing off-the-face styling versatility. Monofilament top is hand-tied and creates the illusion of natural hair growth at the part, alsoallowing you to part the hair in multiple directions. 100% Hand-tied cap made with European Super Fine Crystal Net and is completely hand-knotted, creating supreme comfort and natural movement, allowing each individual hair to move freely like natural hair. Human hair is high quality, lasts longer with proper care and can be styled with heat tools just like your own hair. Adjustable hooks allow you to loosen or tighten the cap up to a half inch to adjust the fit of the wig. No-Slip Grip Ear Tabs help prevent slippage and hold your wig in place. Bangs: 4.5" Crown: 4.5" Nape: 3.25"
Availability: All colours ship in 5-7 business days.